NEWPORT BEACH — Driving along Mariner’s Mile just went from busy to busier last week, as the Orange County Sanitation District began rehabilitating a sewer line along West Coast Highway between Dover Drive and Prospect Street. With the construction project expected to run through at least May 2015, a slow drive along West Coast Highway through Mariner’s Mile – which the city of Newport Beach likes to identify as a “village” – will be even longer. Perhaps those drivers might contemplate the transformation of what is described as one of Newport Beach’s “historic commercial districts.” A stretch of West Coast Highway once specifically dedicated to boating interests is now transforming into a Miracle Mile-like destination home to high property values, complete with boutique shops, high-end automotive dealers, and trendy restaurants. One of the newest arrivals on Mariner’s Mile is Pizza Nova. 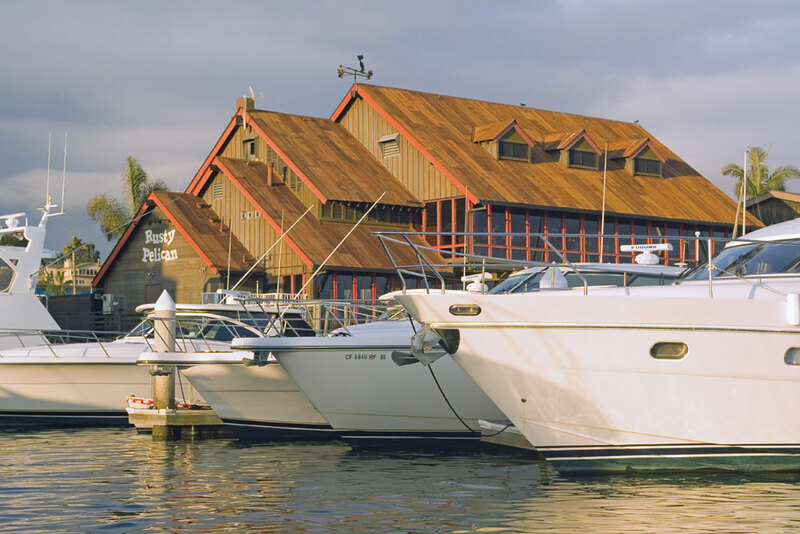 If the harbor and marina views were not enough, the restaurant also offers boat owners an opportunity to dock at its 120-foot slip and either dine-in or have food and drink brought directly to the vessel. Whether Pizza Nova is a microcosm of Mariner’s Mile next-generation transformation is yet to be seen, but the stretch of West Coast Highway is certainly evolving according to Capt. Tom Zetlmaier, who owns Classic Yacht Excursions at the northern end of the district. While Classic Yacht Excursions is relatively new to Mariner’s Mile, Zetlmaier has nearly 40 years experience with the area, spending some time working in the waterfront district. He added there was a time when Mariner’s Mile was an ideal location for boat owners. “It was an area if you needed a part or a shipwright, it use to be a good starting point or if you stuck out one of store owners could give you a lead. Now…..well, not so much,” Zetlmaier said. A collage of businesses and destinations currently dot West Coast Highway between Dover Drive and Prospect Street, including eateries such as Pizza Nova (no connection to the former Villa Nova once open up the street), Divbar Smokehouse Barbecue, Joe’s Crab Shack, Rusty Pelican, The Winery and Pizza Mozza. Beyond food, Mariner’s Mile is still home to boating-themed businesses such as Almond Surfboards and Design, Balboa Bay Club, Duffy Electric Boat Co. and Hornblower Cruises and Events, among others. There are also high-end car dealerships, boutique shops, and other mainstream or niche business. One of those boutique destinations is Toledo Wildlife Works of Art. The art gallery featuring wildlife-themed paintings arrived at Mariner’s Mile about four months ago. Daniel Toledo, who owns the art gallery with his wife, said “good fortune” brought him and his work to Mariner’s Mile. The couple travels daily to the second floor art gallery at 2700 West Coast Highway from their residence in Whittier. “It was kind of destiny,” Toledo said, adding he was not looking to open an art gallery but the unique location of Mariner’s Mile and overall weather conditions in the area were major draws. Business is slow for the art gallery right now, but Toledo believes it will ramp up with advertising. Perhaps the phrase “destination shoppers” will define the demographic of those who patronize Mariner’s Mile for the foreseeable future. What once was a starting point to find parts or quality workmanship for a boat is now a place to eat at a niche pizza restaurant or buy unique wildlife paintings of tigers or lions or jaguars. The city of Newport Beach has certainly played its part in guiding the evolution of Mariner’s Mile. Originally zoned for marine and boating interests, the village was rezoned in 2006 as part of Newport Beach’s General Plan update. Today, Mariner’s Mile is a mixed-use district, making it prime real estate for commercial and residential development. Newport Beach Assistant City Manager Steve Datum said while Mariner’s Mile is zoned for mixed-use, boating and marine interests is still relevant to the village. Datum, pointing out Mariner’s Mile has a long history of being a dining destination; said Newport Beach will regularly be reaching out to stakeholders, including harbor commissioners, to determine how the village will take shape in the next few years. A boardwalk could eventually be in store, though there are no plans or even discussions in play just yet to incorporate the feature into Mariner’s Mile. Economic development studies could soon be in the works to look into how some of the village’s newest arrivals have benefitted the city and region. Still, with Mariner’s Mile zoned for mixed-use, it appears to be on track in becoming a commercial destination where artistic, automotive, aquatic, culinary, and other lifestyles converge. Zetlmaier is not fond of the changes to Mariner’s Mile. At the same time, he understands change is inevitable.